Emma Watson on her favorite scene in new film "The Half-Blood Prince"
(CNN) -- What would you ask the cast of "Harry Potter" if you had the chance? 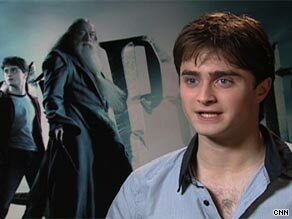 You asked Daniel Radcliffe which literary characters he draws on for his portrayal of Harry Potter. That was the question we posed to you on CNN's iReport ahead of the highly anticipated sixth installment in the series, "Harry Potter and the Half-Blood Prince." We asked you to record a video of your questions for Daniel Radcliffe (Harry Potter), Emma Watson (Hermione Granger), Tom Felton (Draco Malfoy), Rupert Grint (Ron Weasley) and director David Yates and upload them to iReport. What questions would you have put to the cast of "Harry Potter?" Jenna Bergstraesser, 17, Rhinebeck, New York asked Tom Felton, "What steps did you take to prepare yourself for Draco's increased role in 'The Half-Blood Prince'?" Lindsey Breitzman, 23, Madison, Mississippi wanted to know, "When you are filming a movie, it doesn't necessarily go in sequence, so how do you keep yourself in the right mindset as the character in order to keep the continuity of the film?" Dilan Mian, nine years old, from Toronto, Ontario asked David Yates, "How were you able to make the magnificent creatures that are in the 'Harry Potter' films?" Freya Bailey-Barker, 15, from Brighton, England left the following video question for Emma Watson: "What was your favourite scene to film in 'Harry Potter and the Half-Blood Prince'?" Watch the video to hear David Yates and the cast's exclusive responses to CNN iReporters.